With the Xbox One platformer Chariot, Philips Hue bulbs change color and brightness in sync with the on-screen action. 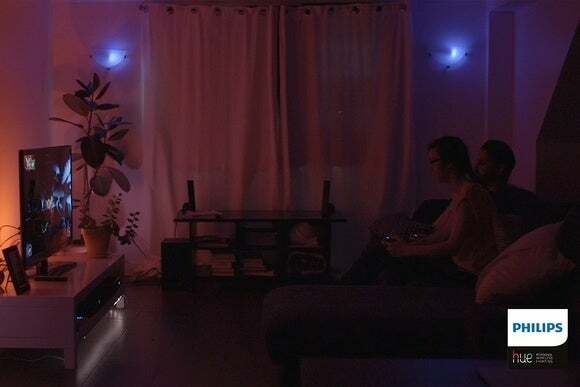 Philips Hue connected light bulbs are going a step beyond ambient lighting, and syncing directly with a video game for the Xbox One. With the Xbox One indie platformer Chariot, the action on the screen corresponds in real-time with the color and brightness of Hue bulbs. For instance, the bulbs will blink red when enemies attack, and will match the colors of the game’s flowers as they bloom. A demo video shows both subtle shifts in ambient lighting and quick bursts to punctuate the action. We’re trying to get some more details on exactly how this works, but presumably there’s some sort of setup screen within the game to connect with Hue bulbs. Philips offers an API for controlling the connected light bulbs in various ways, which may be what Chariot developers Frima are using to send signals to the lighting system. While this is the first video game to synchronize with Hue lighting, it’s not the first form of media to do so. Philips has previously partnered with the Syfy channel to offer a light track for the Sharknado films and the 12 Monkeys TV series. Another light track will be available for the premiere of Sharknado 3 on July 22; users can activate it through Syfy’s Sync app for iOS and Android. Why this matters: Chances are, you’re not going to outfit your entertainment center with Hue light bulbs for the sake of one video game. Still, it’s a clever use of connected lighting that goes beyond the basic convenience factor that most smart home brands are banking on. Hopefully Philips can find a way to get more game makers and video producers on board.